Larson is a popular American shipyard, with a little more than a century of history. Its creator, Paul Larson, initially could hardly even have thought that his creation would become a true symbol of success and high quality in the field of yacht shipbuilding for an entire era. Even now, when the shipyard’s reputation is firmly secured on the most successful positions in the world of the leading brand manufacturers of yachts, here with the same fiery passion, as in the early years of the Larson brand, they create new models of boats, using to create them existence of experience. It all began at the dawn of the 20th century, in 1913, when in the town of Minnesota on the Mississippi coast, Larson built a small shipyard, trying to introduce other Americans to his passion for yachts. The first models of boats, released on the production sites of the company Larson, had a classic design and high quality, which did not go unnoticed among lovers of sea travel. At first they were wooden oars, and a little later standard sailing models. Over time, wood was replaced by steel, and in post-war years, by duralumin. Larson constantly focused on fashion trends and tried to catch those nuances that could lead to success among consumers, and he was able to achieve what he wanted. Released in the 60s. The model with the symbolic name All-American has become a true shipyard symbol, bringing this brand to the top outside the US, and, being refined, is still the constant flagship of Larson. This brand definitely does not belong to conservatives. Innovative ideas from year to year - the most characteristic feature for the products of this American shipyard. It is also characterized by the constant improvement of technologies for designing and building yachts, including the development of completely new techniques. All this allowed the Larson shipyard to create its own style and a special approach to the construction of boats with the constant supply of fresh ideas to its customers. At the same time, the main priority at all times and with any technology for Larson remains high quality and the desire to create the best of the best yachts. Both for the creation of cases and for the interior design exclusively high-quality materials and the latest technologies are used. Special attention should be paid to Larson's patented special technology for processing fiberglass under pressure, which allows you to create heavy-duty hulls that ensure maximum reliability of the yachts as a whole. This American shipyard even gives a lifetime warranty on the hull of its production. The special American sandwich construction used for hulls easily dampens probable noise and vibration, which ensures a particularly comfortable stay on yachts of any model of this brand. Larson hulls are characterized by a V-shaped bow and flat part at the transom. When creating any model, special attention is paid to the smallest details, and almost all fastenings are carried out exclusively by stainless bolts. The company's extensive experience allows us to avoid mistakes and create reliable, high-quality vessels for true connoisseurs of yachts. The brand has 39 offices, most of which are located throughout the Americas. 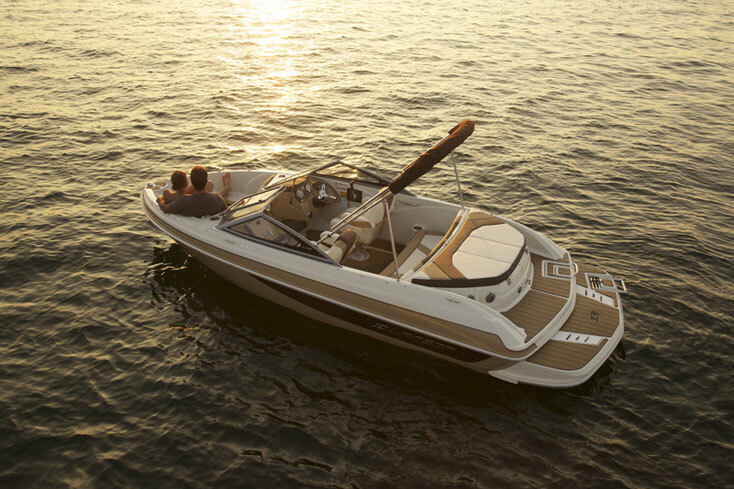 At Larson shipyard, stylish boats are created in the range of 18-37 feet. The modern line has 24 models, among which there are both bowriders and boats for fishing, as well as sports and open motor cruising yachts, as well as high-speed and pleasure boats. The advantage is given to sports, but any Larson model invariably includes a unique, rich experience of yacht shipbuilding and is distinguished by high quality and corporate style, over which time has no power. And just having boarded any of the Larson yachts, you immediately realize that they were created for the most memorable comfortable trips.